Was zeichnet den Alltag des Berufskraftfahrers aus? Das ist die zentrale Frage, der die Auszubildenden zum Berufs-kraftfahrer im Rahmen des ca. 10-stündigen Unterrichtsprojektes My Job nachgehen. Ausgangspunkt stellt der Nachwuchsmangel in der Branche dar, den die Schüler zum Anlass nehmen, um ein englischsprachiges Job Profile zu erstellen, das Einblicke in den Berufsalltag bietet sowie Vor- und Nachteile des Berufs aufzeigt. Auf diese anspruchsvolle Aufgabe bereiten sich die Schüler zusammen mit ihrer Fachenglischlehrerin Frau Sulej entsprechend vor. Hilfreich sind dabei Vokabel- und Grammatikübungen sowie fachspezifische Texte. So bekommen auch die sprachlich schwächeren Schüler die Möglichkeit, Ihre Vorkenntnisse aufzufrischen oder zu erweitern. Schwerpunkt der Arbeit stellt dann das Verfassen der individuellen Profile am Computer dar. Frau Sulej unterstützt dabei individuell. Ein selbst geschossenes Foto rundet das Job Profile ab. Abschließend werden die Job Profiles im Klassenverband vorge-stellt und es wird demokratisch abgestimmt, welches das Beste ist. Ergebnisse dieser äußerst produktiven Arbeit werden im Folgenden jährlich vorgestellt. Ein besonderer Dank ist hier an die Schüler auszusprechen, die sich bereit erklärt haben, dass ihr Job Profile (und ggf. ihr persönliches Foto) veröffentlicht werden dürfen. My name is André. 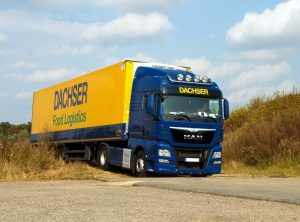 I’m 26 years old and I’m doing an apprenticeship at the company Dachser Food Logistics in Hamburg. I’m in the first year of my apprenticeship of truck driver. In the following text I would like to describe a typical working day with the advantages and disadvantages of my job. My working day starts at 6am. First what we do is to go to our disposal office. They give us the shipping transfer notes for my journey. Then we start to organize our tour. We have to sort the recipients by ourselves. When we’re finished, we have to drive our truck to the loading dock. 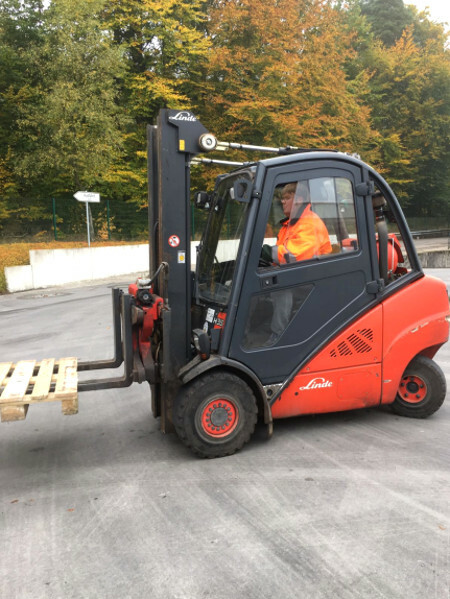 We can use our on-board pallet truck or the electric lifting cart to load our truck. We have to scan every pallet with our penkey, that’s a mobile barcode scan device with GPS, GPRS and WiFi. This is important for our next step. We have to go to the disposal office again to receive our delivery schedule. On the schedule we can find information of sender, receiver and the serial shipping container code of the pallet and the weight of every single pallet we scanned before. We’re on tour 950 with a MAN juggernaut. Our delivery zone is Lübeck and the greater area. We have to drive to the receiving departments of goods. Not every department has a loading dock. For some of them, we need our hydraulic ramp. I prefer loading docks. At some departments, we need to wait between 10 to 30 minutes before we can start to unloaded the truck. I don’t like that. After we have unload the whole cargo of all recipients we call the disposal office. We receive a pick-up request in Lüdersdorf in North-West-Mecklenburg. But things are different there. We have to wait for 3 hours to pick up the good. That is not the regular case, but sometimes it is unpreventable. The pick-up request isn’t the same every day. This day we delivered our cargo too fast for this request. If possible I use this time for my hobby, the photography. This photo occurred during the wait at Lüdersdorf. When we’re finished with loading the truck, we drive back to our home department. We drive to a free loading dock to unload the cargo. Unfortunately we aren’t finished yet. Now we have to go to the disposal office again to hand out our delivery notes and the delivery note of our pick up cargo. Now we’re almost done. We just need to clean our cargo bed and the driver cabin. 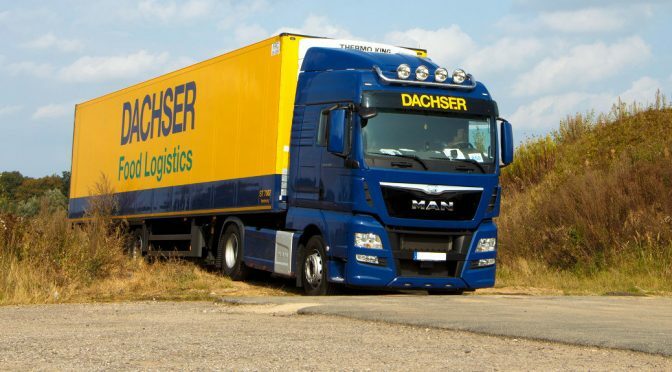 All in all, I really like my apprenticeship at Dachser. The apprenticeship is very exciting and varied. My trainer and all of my colleagues offer me a very pleasant environment. 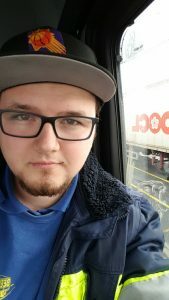 My name is Timo, I am 26 years old and make an apprenticeship as a truck driver at Otto Dörner. My working day starts at 6am on the truck parking area. First of all I start my truck and put in my driver card. Then I go out and look around my truck for defects. It`s my job to take care of my truck. For these work I take at least 15 minutes. Now I go back in the truck and take a look at the tablet for new orders. Now I start to drive to our container place and take the empty one that I need. Then I drive to the customer. Arrived at the customer i drop the container . Last I get a signature from the customer on my tablet and drive to the next. Sometimes I drive to a customer with sand or other building materials and have to pitch it there. To the end of my working day I have to clean and refuel the truck. This is only a short version of my day. I have many of variable tasks in my job. The positive side effect of the job is, that you are your own boss and you will see many beautiful places. You`ve got also disadvantages in the job. 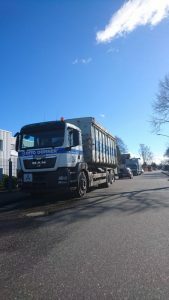 For example you`ve got many traffic jam in the local traffic of Hamburg, you must be at the customer at a destined time. My name is Lukas and I’m 21 years old. I’m doing an apprenticeship as a truck driver and I’m working for Meta&Peter Beeken. In the following I would like to tell you something about my job and describe the advantages and disadvantages about it. Usually, I get up about 5 am. I have a very short way to my company so I’m there between 5:30 and 5:45 am. Then I’m going to the restroom, where the other colleagues sit and have a little talk with them. At 6 o’clock everyone gets to know by the dispatcher where they have to go with their truck. In our company, we are carrying sea container from several container terminals in Northern Germany to our customers for import or the other way round for export. Often the terminals are very crowded and you have to wait very long until you get the container. Also you have to go to the customs office in some cases and this takes sometimes even longer. But almost everywhere there’s a little diner where you can get something to eat or drink. Another good thing is that we don’t have anything to do with loading or unloading the container. That part undertake the warehousemen of the customers. In this case we either wait until the loading or unloading process is finished or we’re detaching the chassis and drive to another customer where another container is ready for transport. In the evening, we’re coming back to the company at about 4 pm or in rare cases sometimes at 7 or 8 pm. In my opinion, that’s very hard because every day you do some overtime, but that’s also a popular disadvantage in this job. All in all, I like this job because I like driving with a big vehicle and getting to know nice places in the various cities I drive to. When you want a job where you always have a chance to work in future then it’s a very good choice to make this apprenticeship. 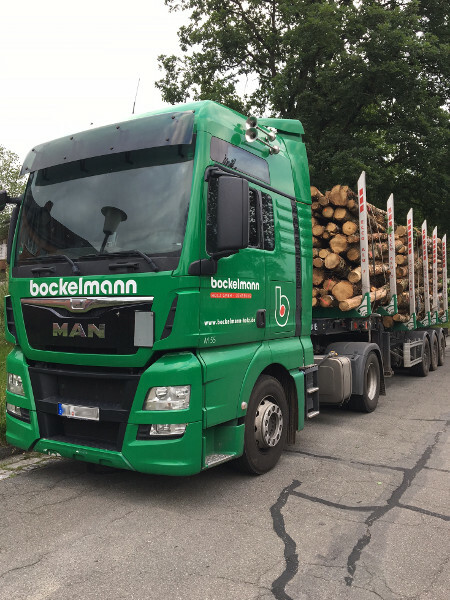 Hi, my name is Zeno Wilken, I´m 17 years old and I´m working for the ´Heilmann AG´, one of the biggest logistic companies in the region of Uelzen. The ´Heilmann AG´ harvests and sells potatoes and onions. Today I would like to tell you my typical working day at my company. Firstly I get up at 6am and I make breakfast for myself, then I take ashower. After shower I go for a walk with my dog because my parents are already gone to work. After 30 min I arrive at home and I´m completely awake now. It’s already 7am and I go out to my motorcycle to control everything on it, then I´m driving to my work, it takes only 4 minutes to get there. So, after I arrived I´m going to our ´classroom´. The first thing I do there is a coffee for my education manager. Now it´s 7:25am and my co-trainee comes in and we talk about what we are going to do this day. After another 10 minutes my education manager comes in and he tells us what we are going to do, normally my co-trainee learns for his driving license and I help my education manager (this word is too long 😉 in the following text I call him by his name: Mr. S.) with the office work. This takes time to our lunch break. In our break my co-trainee and I are going to Aldi (Aldi is just 20 meters from our company grounds) and buy some food for us, especially for Mr. S.
The lunchbreak is over at 1pm Mr. S. tells us that we have to help to load the trucks, we are going to Mr. M., he is the managing clerk. He tells us what we have to do for the next hours. We are occupied with our work for a long time…… now its 2pm and Mr. S. comes to get us in the ´classroom´. We sit in the lessons for the driving license. This takes 1,5 hours, after that, we talk about the day and Mr. S. asks us whether we have any questions or problems, normally we don’t have any problems ;). In the end I make coffee and we just talk a bit about everything, now it’s 4:15pm and we end our work day, I say goodbye and good evening to Mr.W. (my co-trainee) and Mr. S. I go home now. So, that was my typical work day of course, not every day is like that. My name is Robin Petersen. I am 21 years old and come from Lüneburg. I want to describe my job as a trainee at Bockelmann-Holz GmbH. First to become a driver, you have to work at our own garage to learn more about the mechanics and engineers of trucks and then we can do the driver licence for trucks and trailers. In the evening I stop at roundabout 05.00 pm. Now I am going to a shop or something else. It’s your free time so you can do what you want….